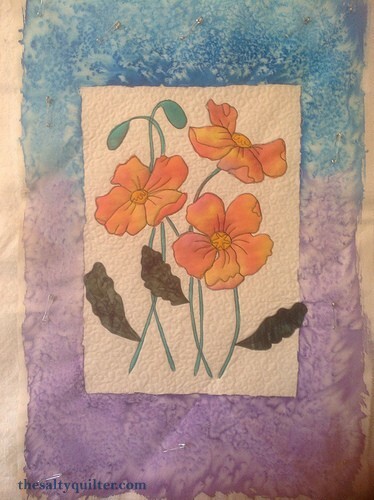 Used a mix of batiks from Hancock’s fabrics. 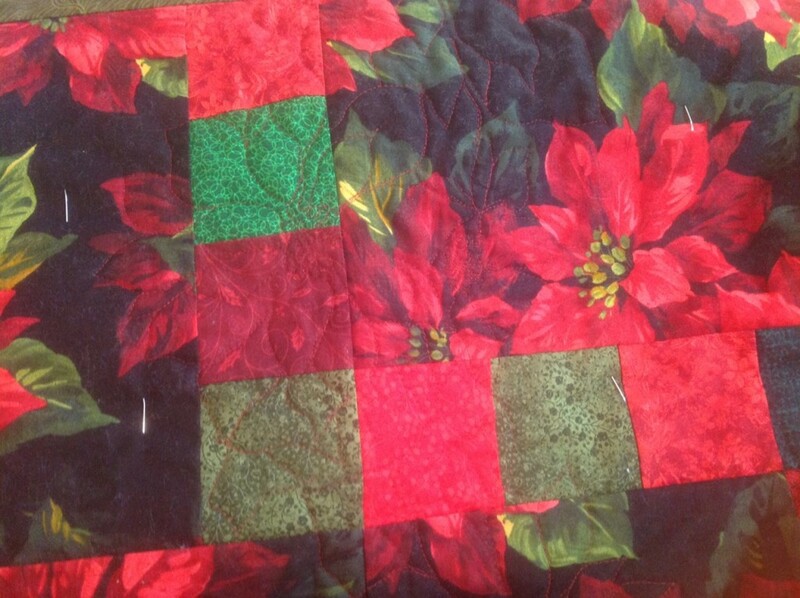 Grandma Mary Jean pieced the blocks, I added the borders and quilted it. 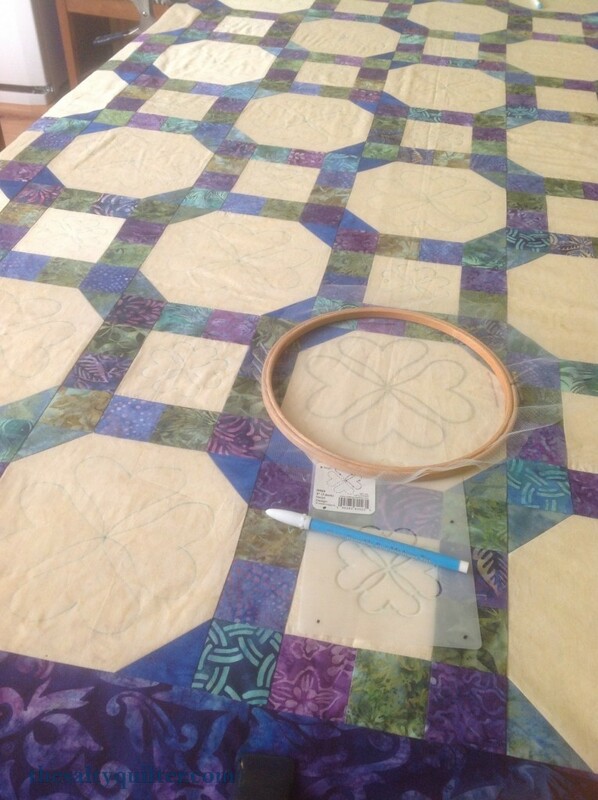 Used Harriet Hargrave’s clover heart template for the blocks. Continuous curves in the rings. 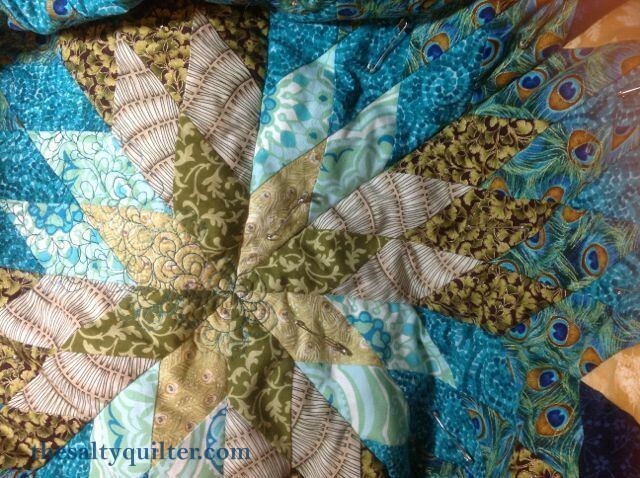 Feather spiral in the border. 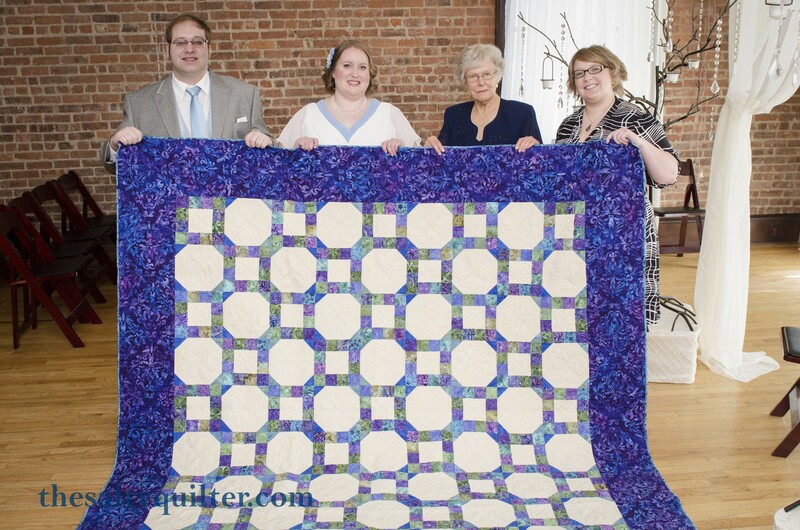 Presenting the finished quilt at the wedding. 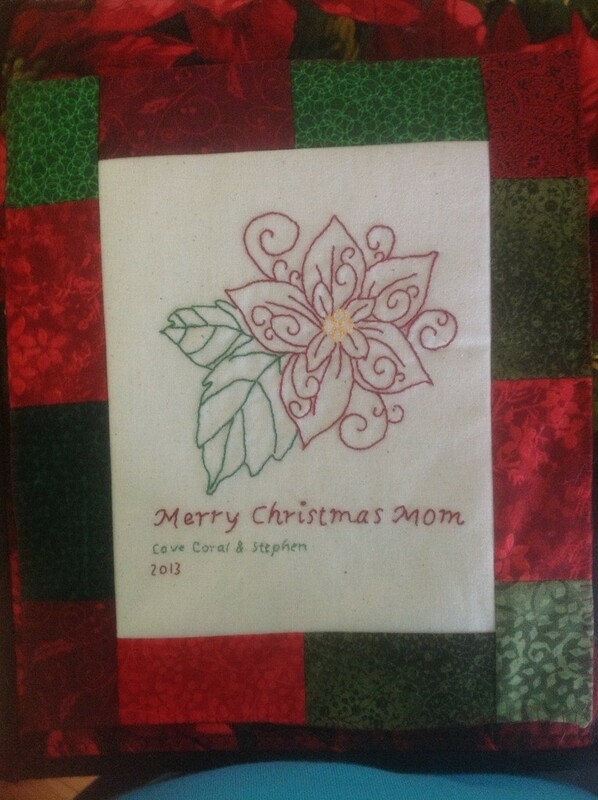 I used a plastic template and a net template for the different sized motifs. 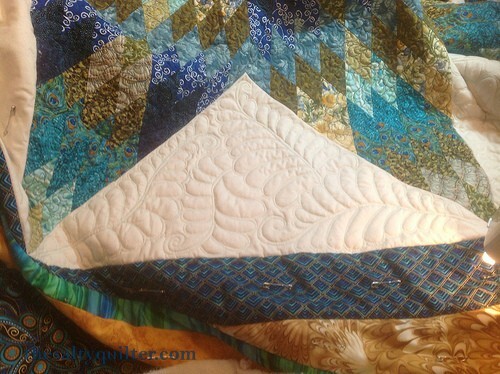 Storm at Sea and Ocean Waves quilt begun at Rosemont Patchwork class. 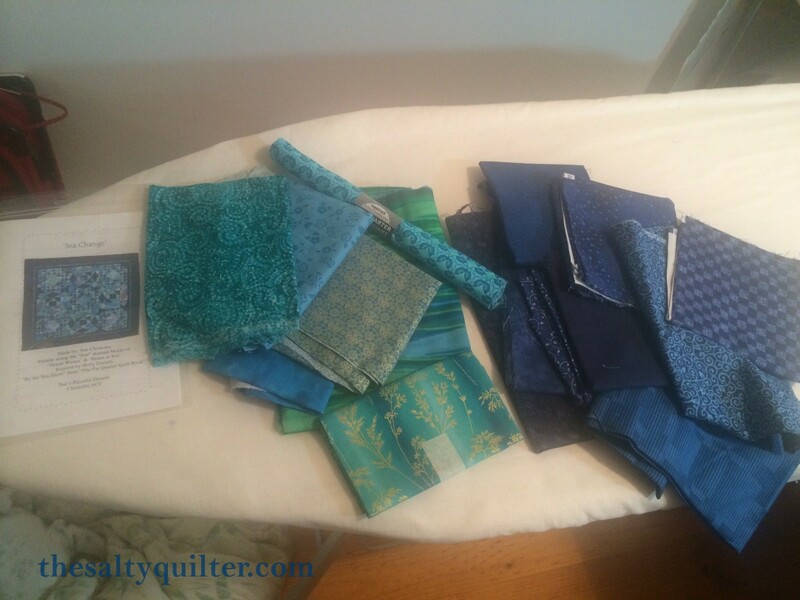 Fabric from my stash. 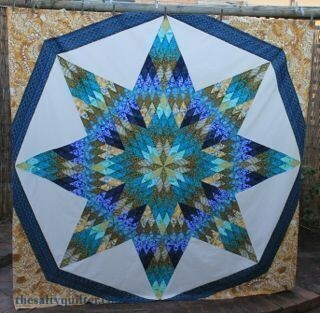 I am struggling with getting points to match piecing the half-square triangles for the Ocean Waves blocks. 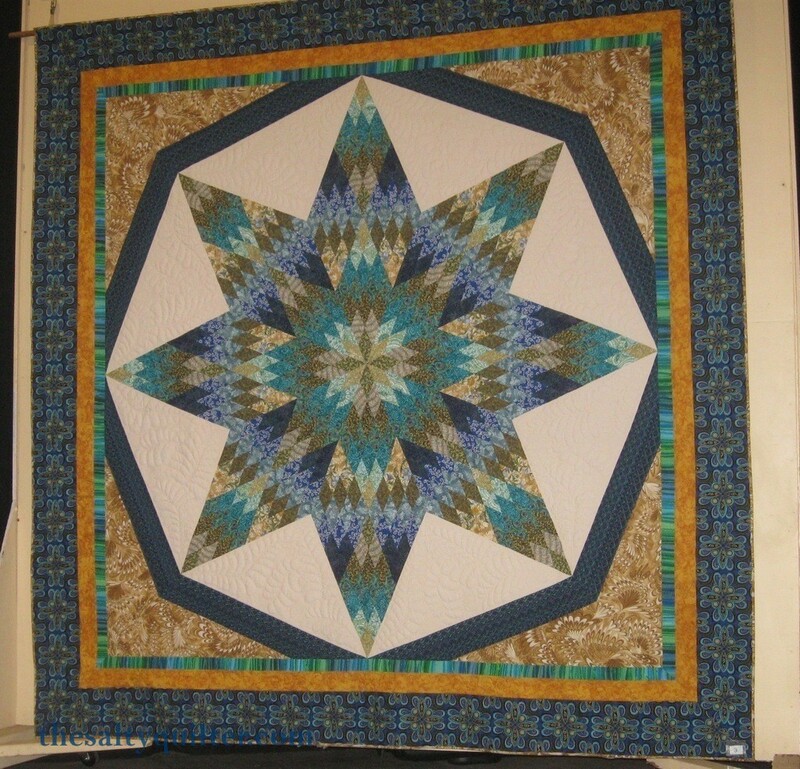 The Storm at Sea pieces were cut from a template – I’d like to go back and re-do them so they’re paper pieced. Space: the final frontier. 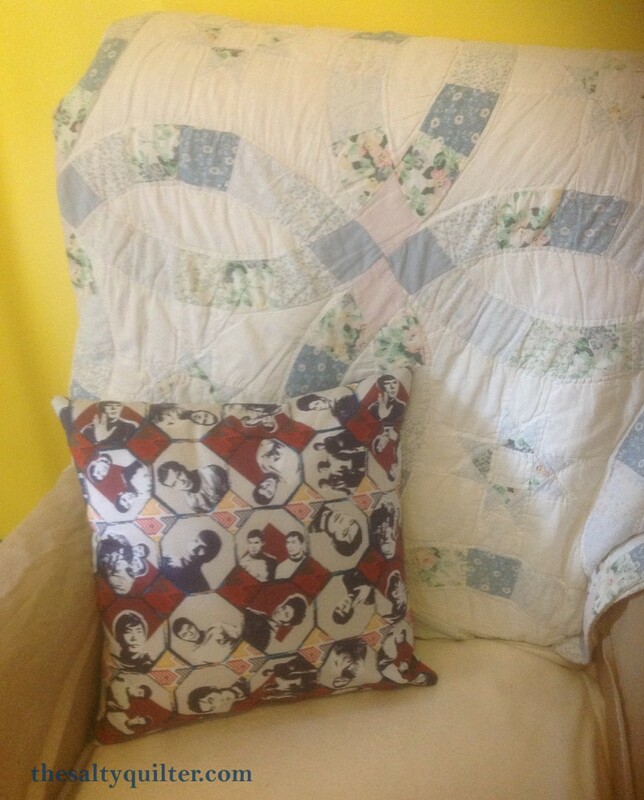 These are the voyages of the pillow Enterprise. 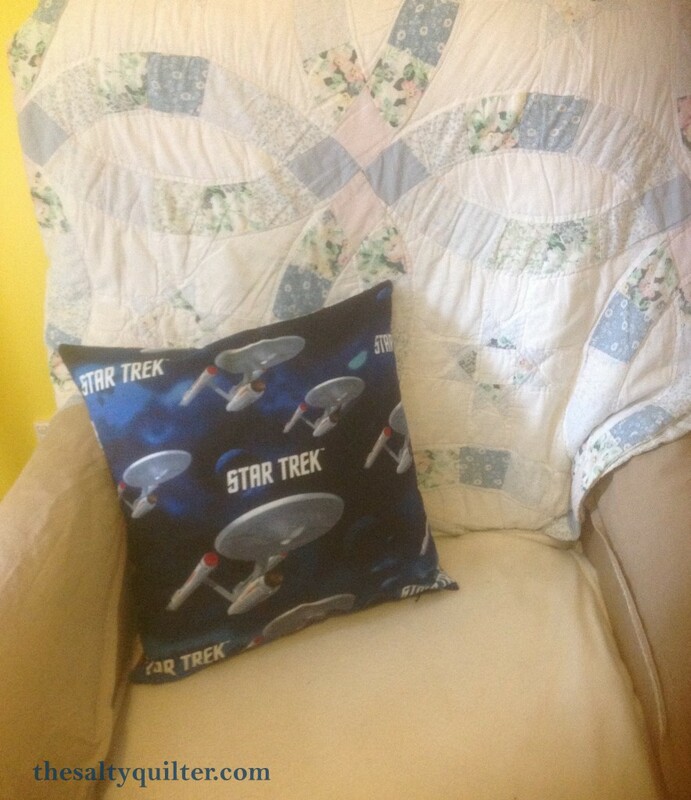 Its five-year mission: to explore strange new furniture, to comfort new life and new civilizations, to boldly go where no pillow has gone before. 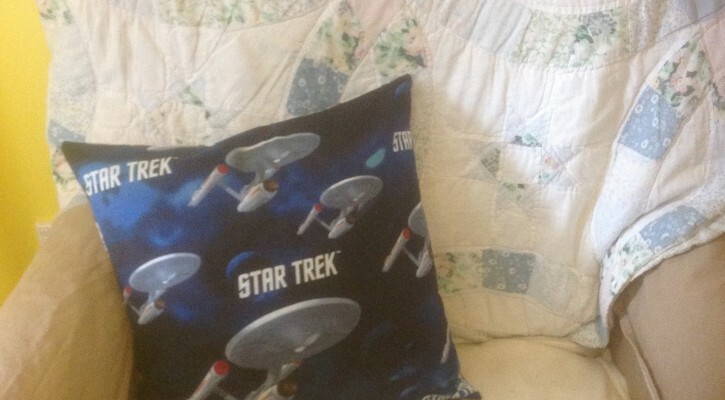 This pillow is for my slightly geeky Trekkie MIL. She’s more of a TNG fan, but original series was the only fabric available. 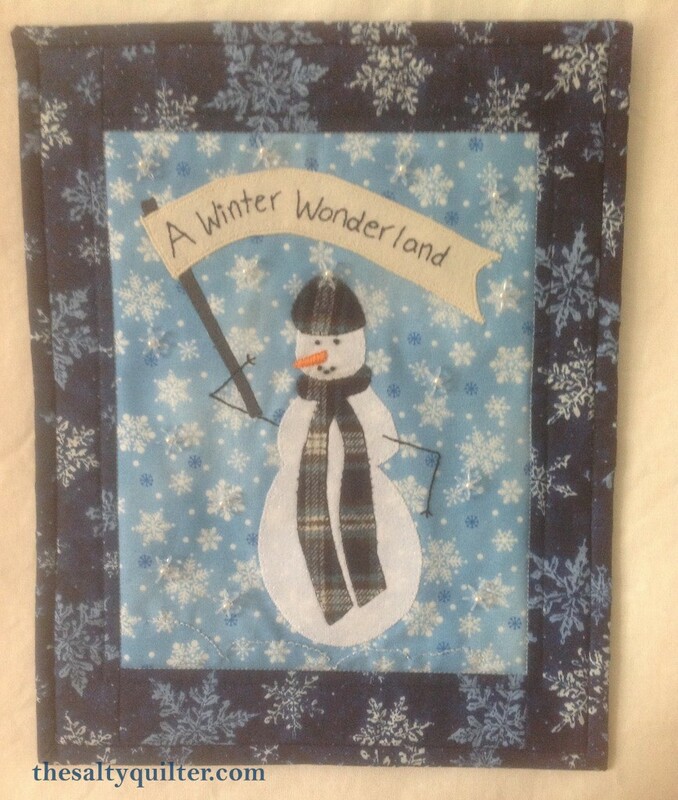 Fusible appliqué with buttonhole machine stitching. 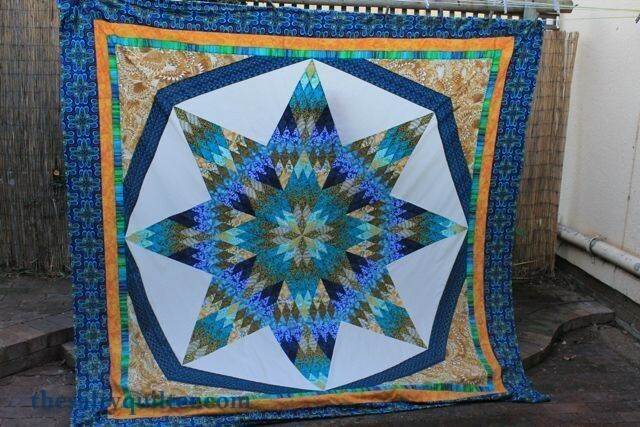 Embroidery and sunburst beads. 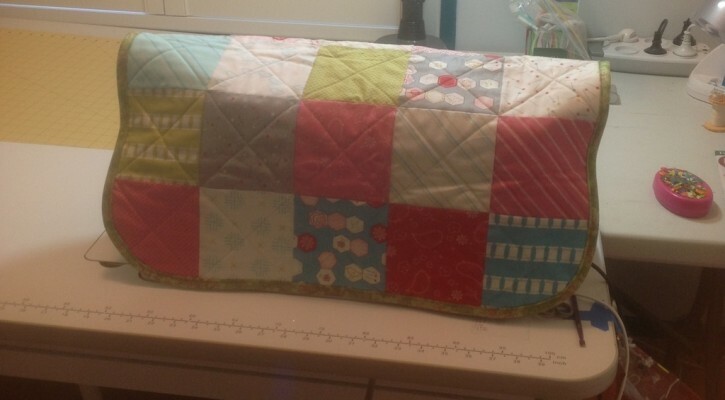 I wanted to make a dust cover for my sewing machine that would fit while it was in its table. 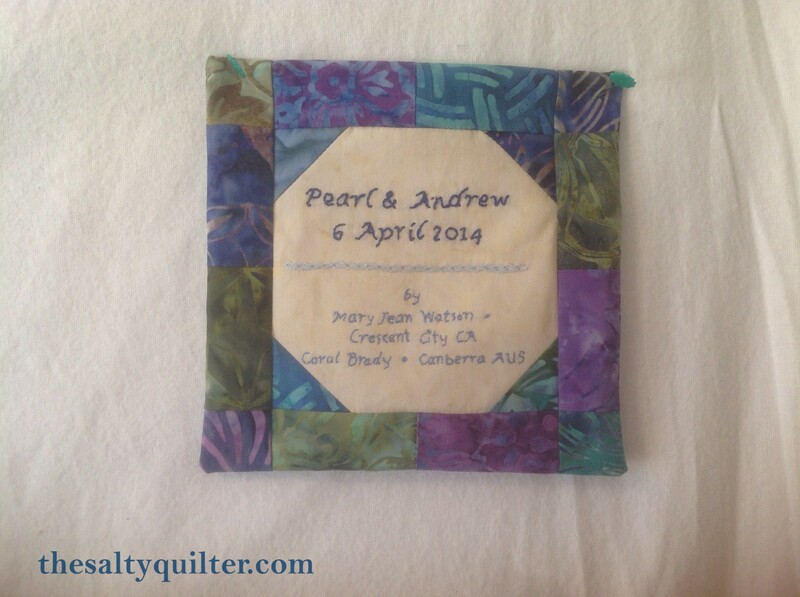 I used a charm pack of the Sew Stitchy range, 5 x 6 squares, quilted diagonally. 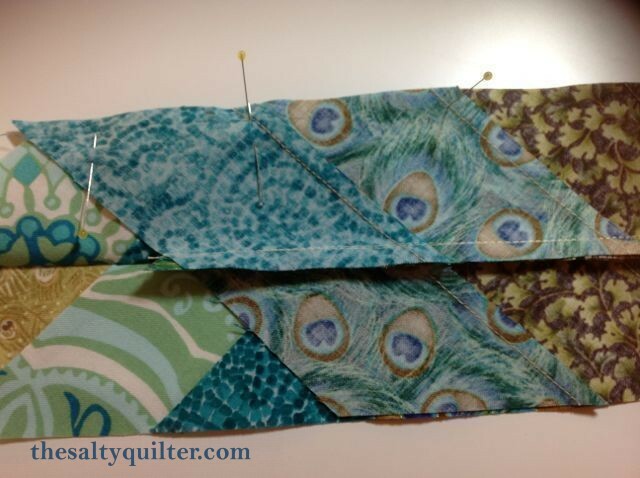 I used pre-made bias binding, and some measuring tape ribbon for ties. It’s a little big, but will do the job. 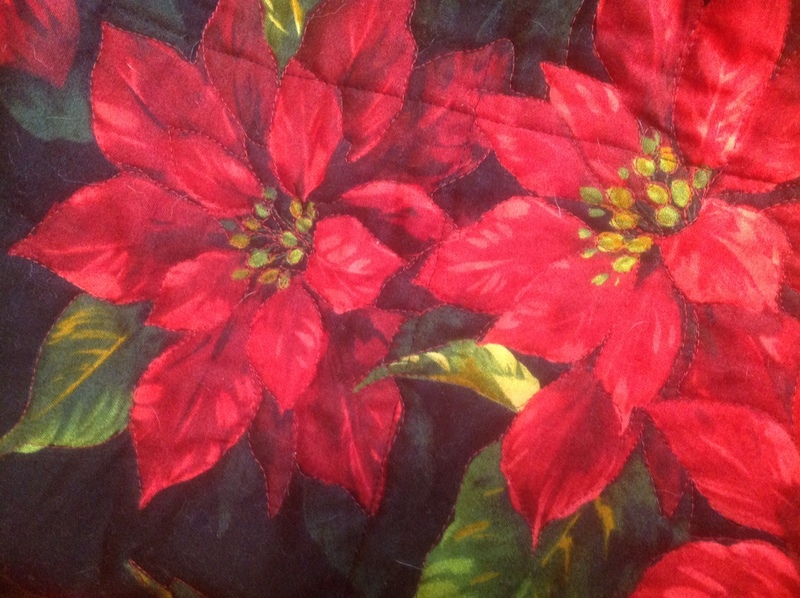 The pattern was not great. 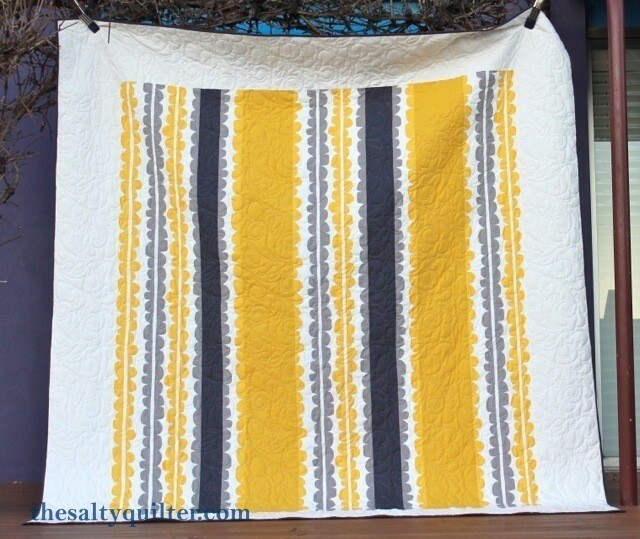 It’s a shame they don’t include instructions for a length wise outer border. 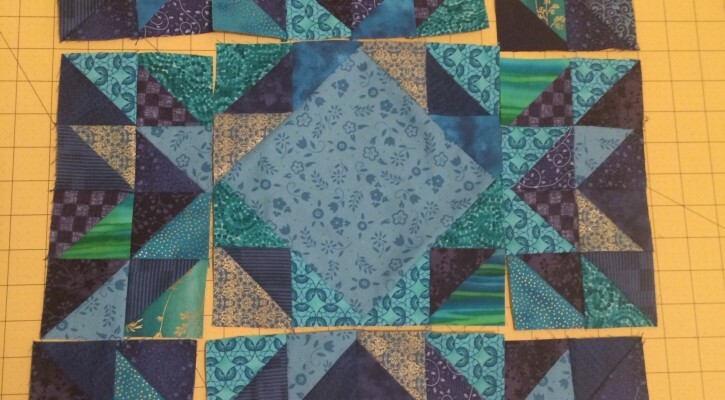 If alternating colours of scrappy blocks, make sure 10 start with colour A and 10 with colour B. 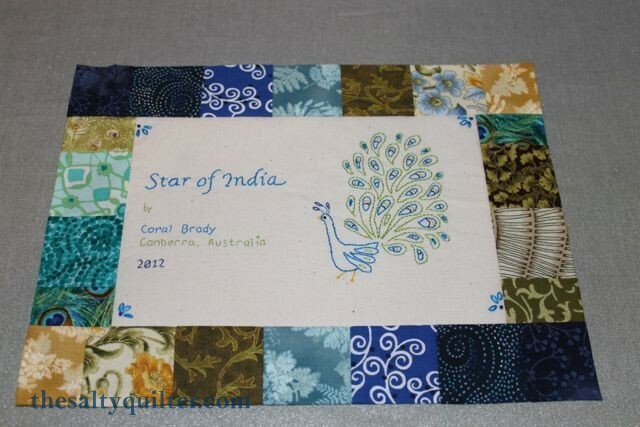 The pieced border should end with the same colours length wise, and the other colour width wise. 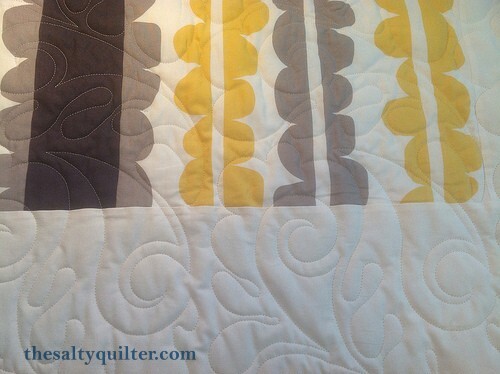 The amount of fabric listed for the backing will only give you approx 2″ overhang on the top and the bottom of the quilt. If you are sending to a longarmer, recalculate the backing requirement. Quilted from the back, using the Poinsettia print fabric as a guide for quilting. Matilda’s Own Cotton/Poly hi-loft batting. 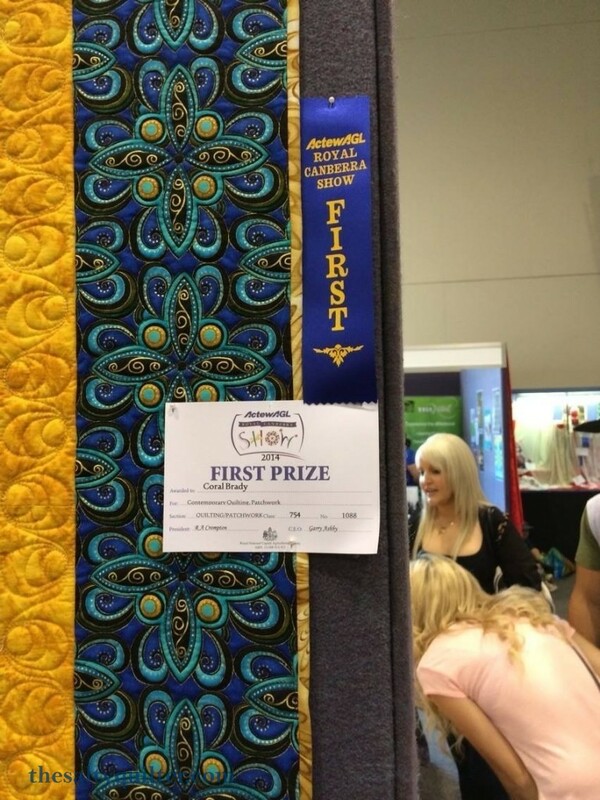 Entered and shown in the 2013 Braidwood Quilt Event. Won first prize for Contemporary Patchwork and Quilting at the 2014 Royal Canberra Show. 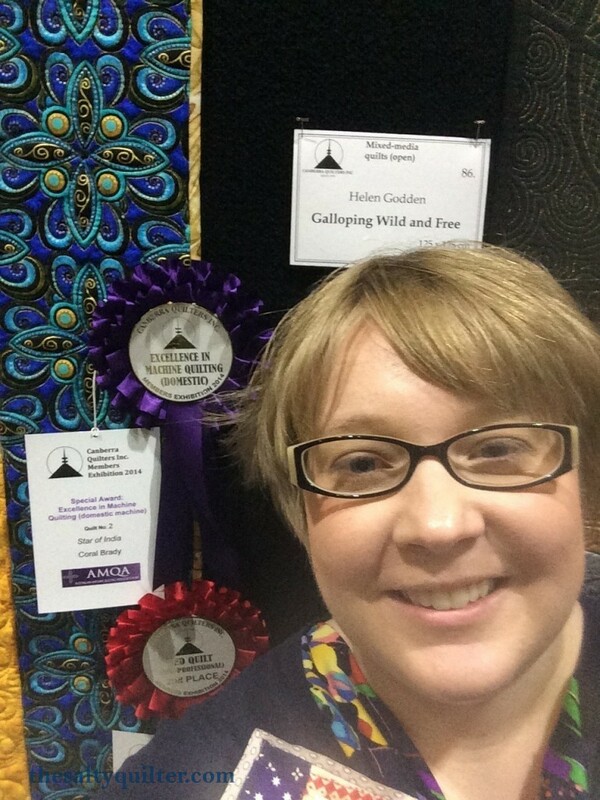 Won 2nd place in Bed Quilts (non-professional) and Excellence in Machine Quilting (domestic) at the Canberra Quilters Exhibition 2014. 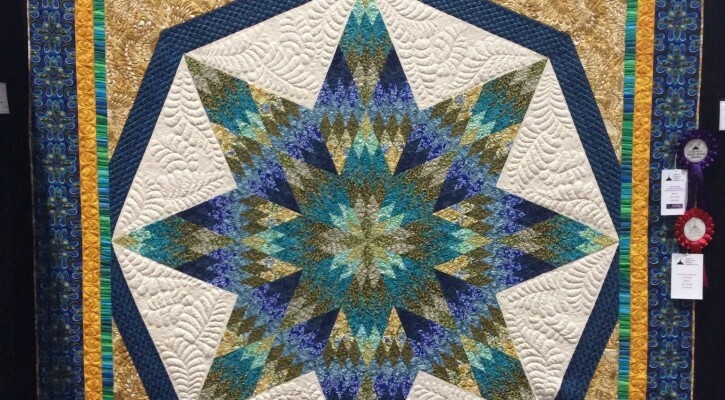 Begun in a Lone Star class taught by Sue at Rosemont Patchwork Shop in Tugerranong. 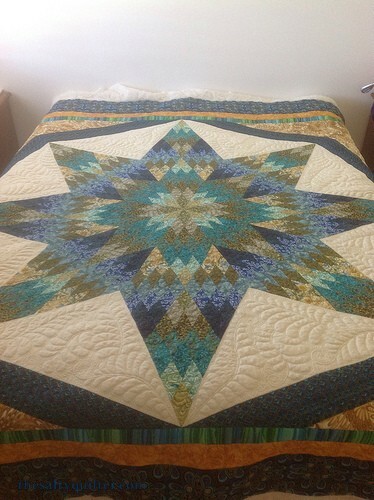 I consider this quilt to be my “thesis”, graduating from a beginning to intermediate quilter. 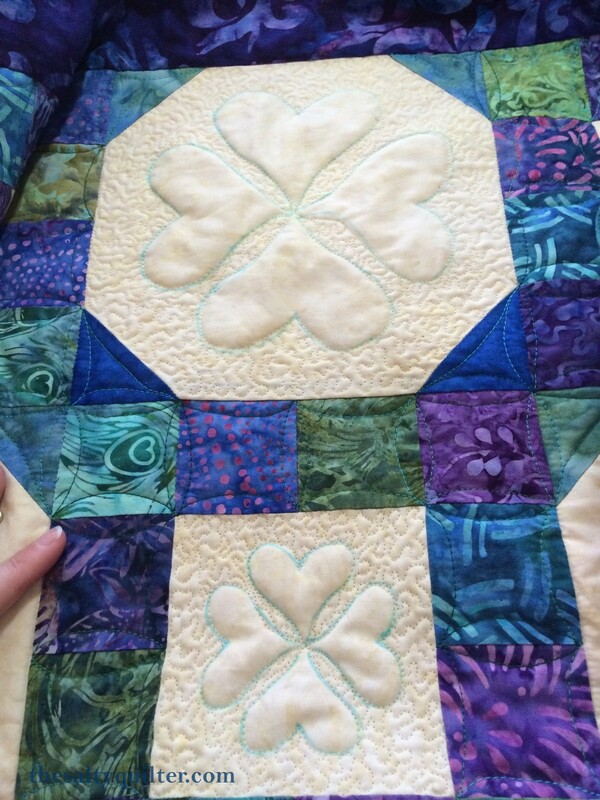 Quilted in the ditch with YLI invisible thread (clear). 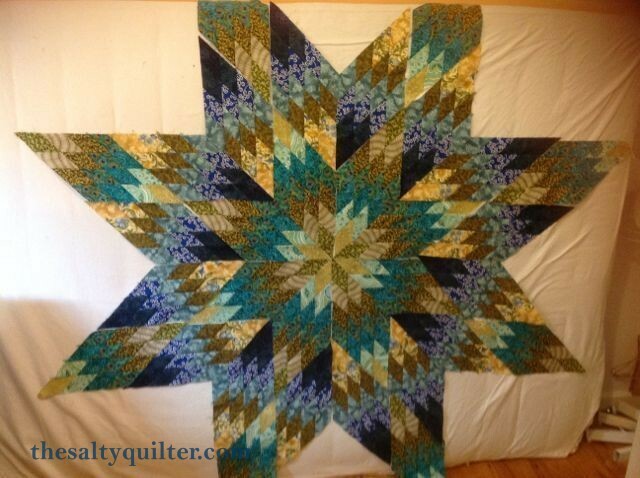 Star is quilted in Signature Variegated thread in blue/green 40wt cotton. 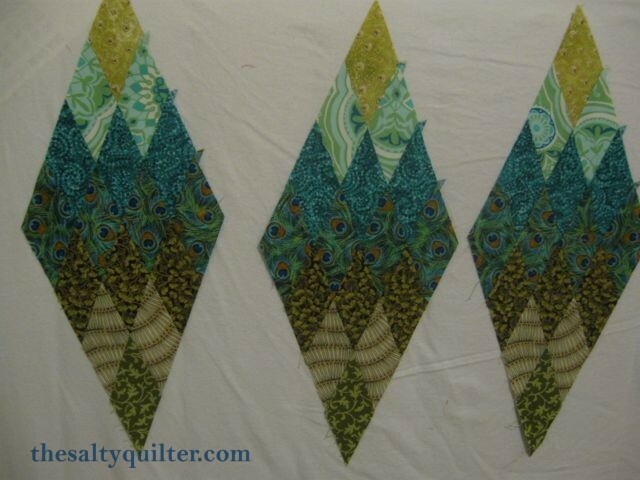 Feathers in Gutterman 50wt cotton, micro stipples in Rasant. 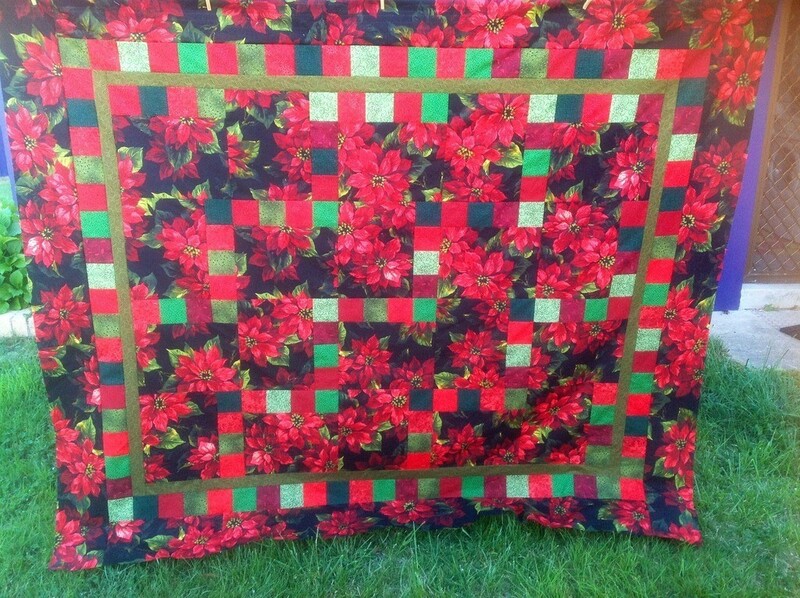 Rest of quilt in Gutterman and Signature. 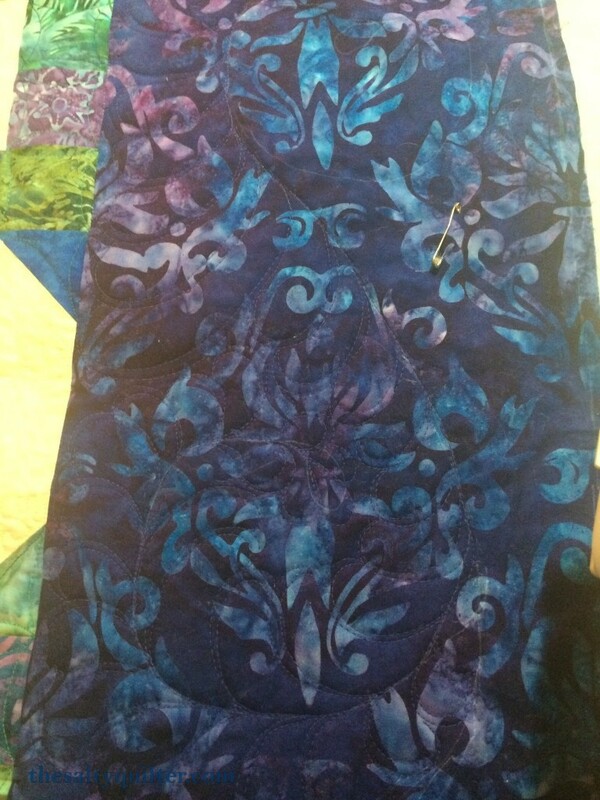 Outer border quilted with Sew Art smoke invisible thread and the Bottom Line poly thread in the bobbin. 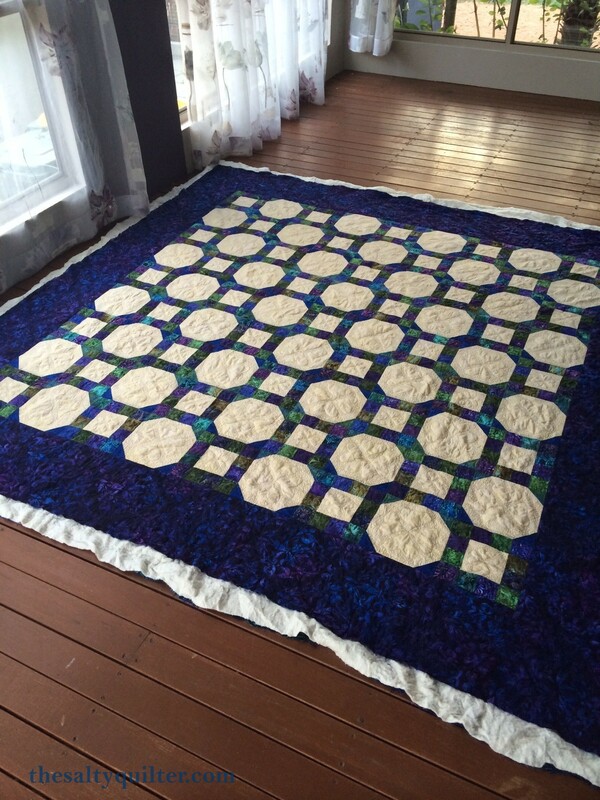 First quilt using “show blocking” technique before squaring and binding. Very effective. 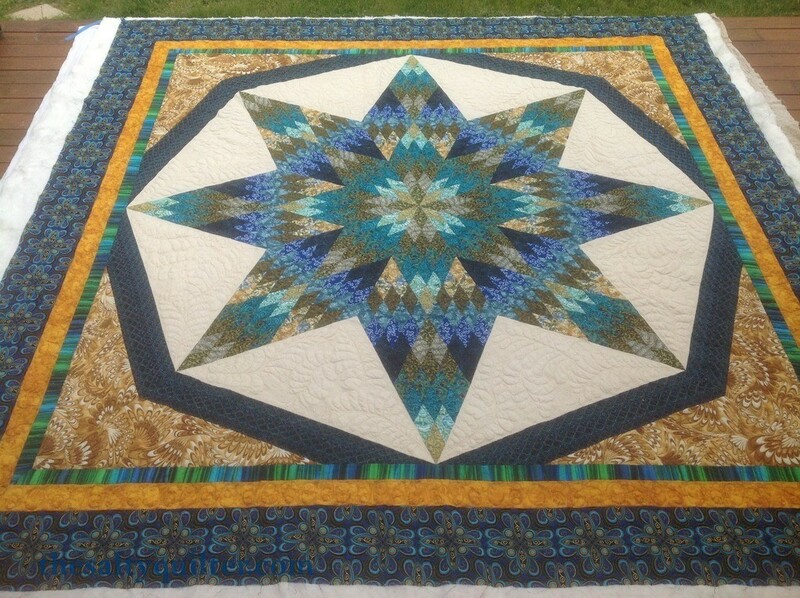 “Paisley” or shell quilting on centre star. 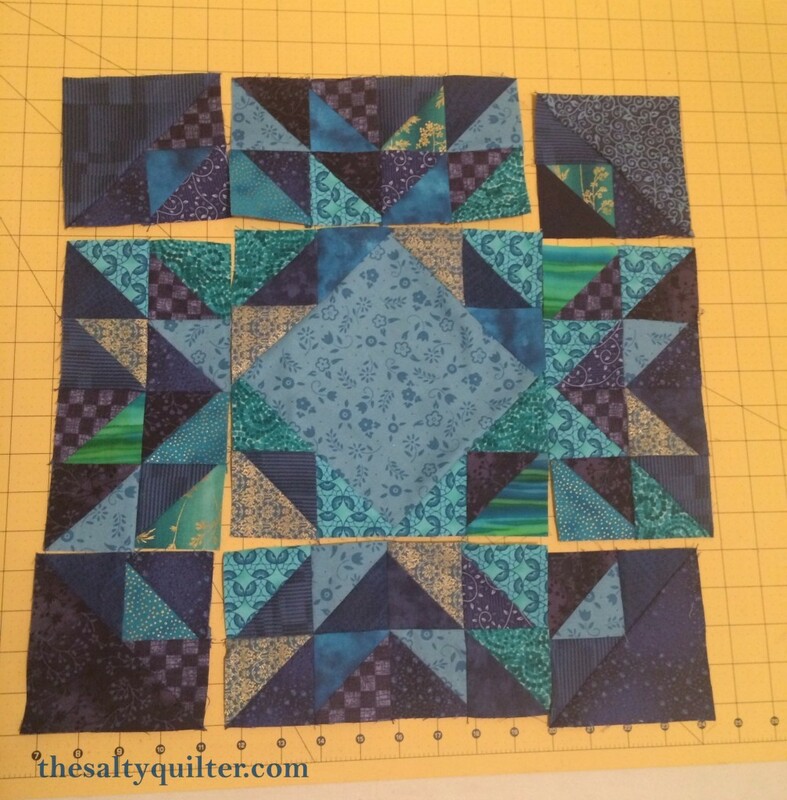 Pinning the diamond rows together. 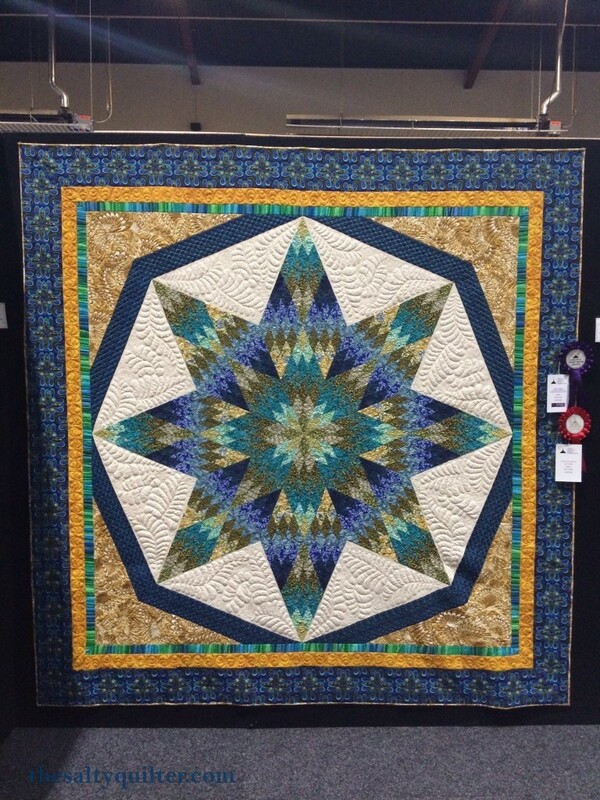 Class by Helen Godden at Hobbysew Belconnen. 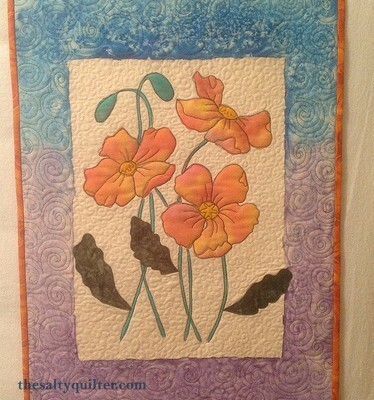 Her poppies design, traced and painted by me. It was done using Genesis Creations Liquid Radiance pigment. It was similar to doing watercolour. 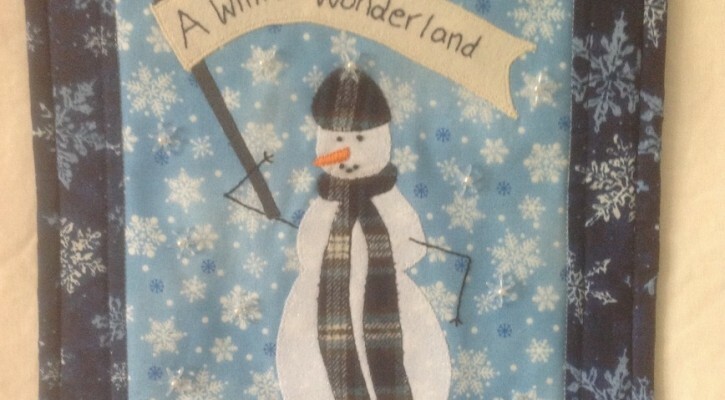 Used salt to get splotchy effect on border. 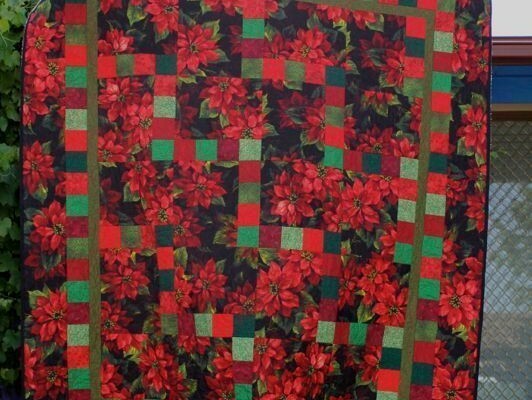 Flowers outlined in black thread quilted over at least twice. 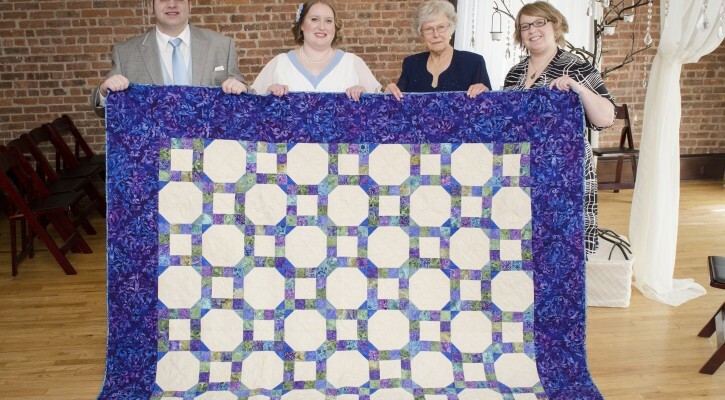 Wedding gift for my cousin and her wife. 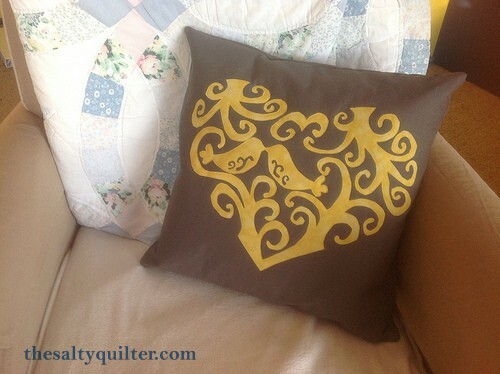 Raw edge appliqué. 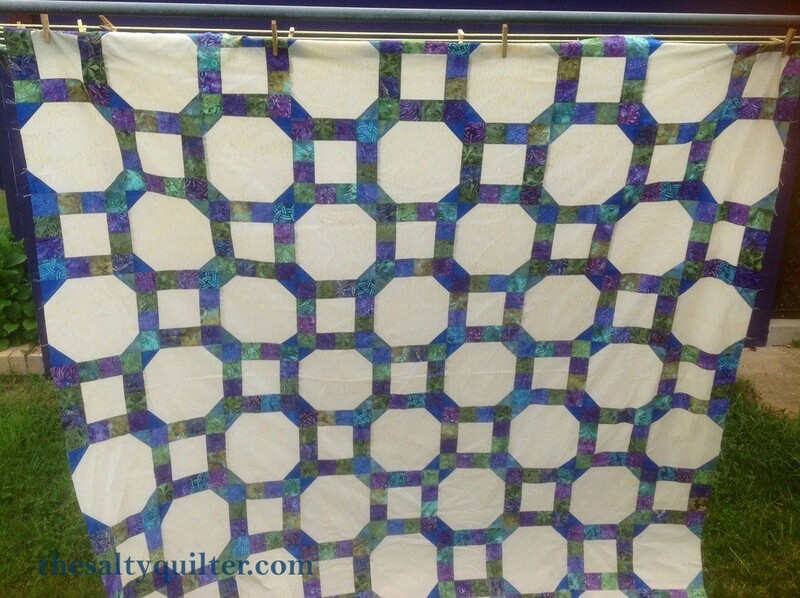 This pattern requires a medium weight fusible web like Steam-a-Seam 2 and a fabric with a fairly tight weave like a batik, otherwise the curls fall apart. 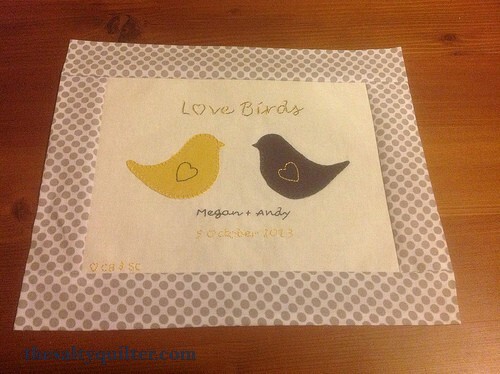 Wedding gift for Andy and Megan. 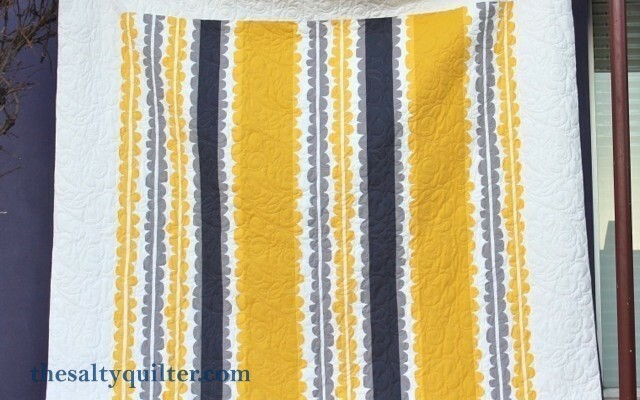 Pattern uses “stripe” fabric cut length-wise with matching solids. 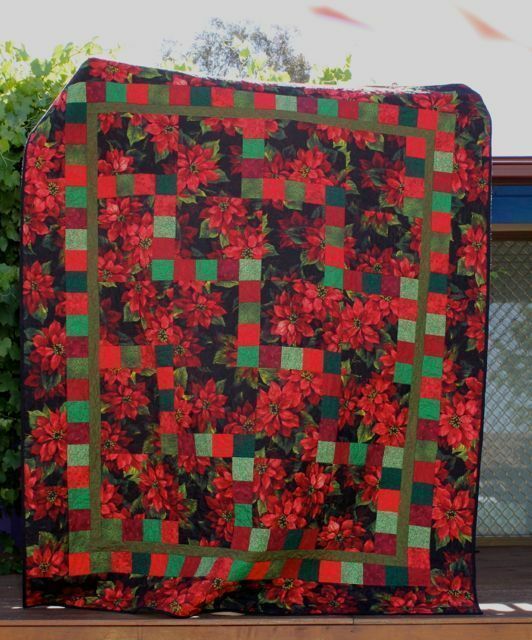 Quilted by Jeanette at GoneAussie. 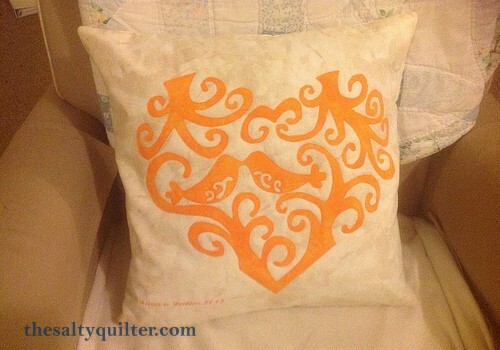 Paisley feathers pattern with cream thread.